I am so excited to tell you all about the newest product I found (yes, at Whole Foods Market). Every time I go into that place I end up going up and down each aisle to see if there is anything new and intriguing on sale. This past weekend I stumbled upon “bean pasta”. This company, Explore Asian, has come out with “pasta,” but it is only made up of two ingredients: different types of beans and filtered water. 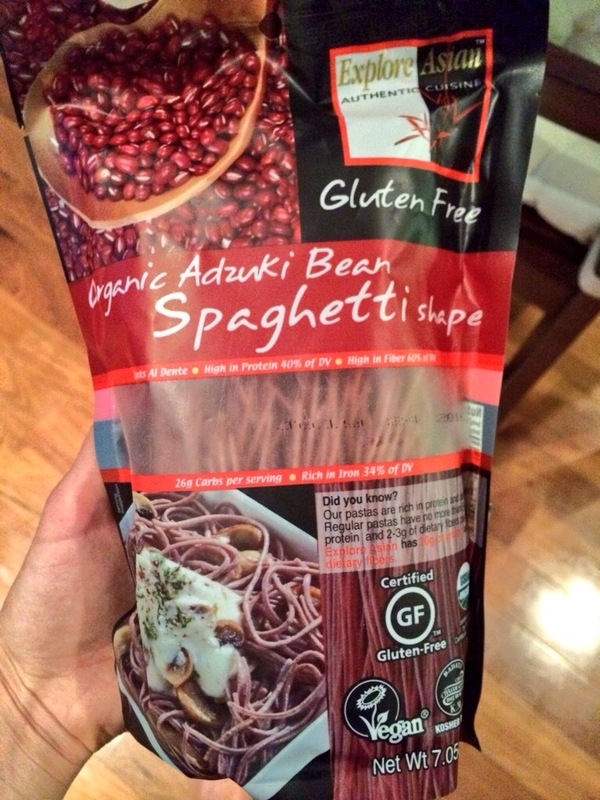 I immediately got excited to try it and grabbed two different flavors; edamame fettuccini and adzuki bean spaghetti. These pastas are loaded with protein and fiber, low in carbs, high in iron content, and sodium free. You cook them as you would normal pasta, except, it only needs about 4-8 minutes depending on the type; just follow the packages instructions. Then, it is up to your imagination to dress them up how you would like! I created a fall vegetable pasta dish by adding roasted butternut squash, mushrooms, caramelized onions, and garlic then topped it with parmesan cheese and olive oil. The “pastas” themselves have a great deal of flavor so depending on the bean type you can pair vegetables and meats accordingly. 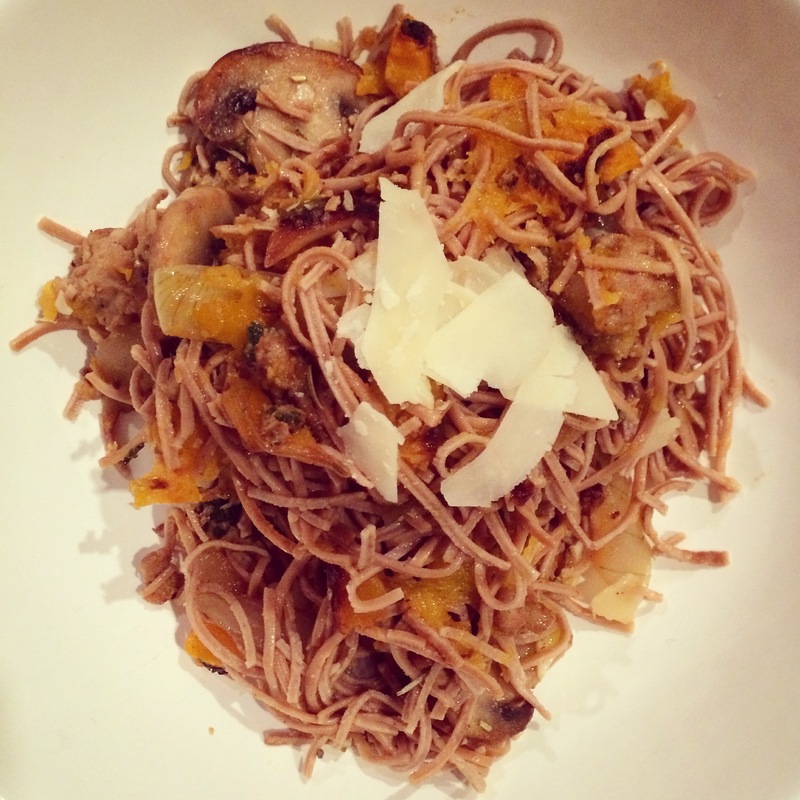 These are an awesome way to reduce your carb intake and still get the feeling you are indulging in a great pasta dish! Divide the squash, mushrooms, onions, and garlic onto a baking sheet. Drizzle with olive oil and season with garlic powder, salt and black pepper, toss to coat. Roast for 25 – 30 minutes or until the vegetables are tender and starting to brown, flipping the vegetables once with a spatula. I like to broil for the last 5 minutes or so to get the squash crispy. While the vegetables are roasting, bring a large pot of salted water to a boil. Cook the pasta according to the package directions. Reserve a half a cup of the pasta cooking water, drain the pasta and rinse with cold or hot water (depends on the bean type). Return the pasta to the hot pot. Add the roasted vegetables to the pot along with the reserved pasta water, and lastly sprinkle in the rosemary and Parmesan cheese. Toss well to coat. Season to taste with more salt and pepper if desired. Serve the pasta with a drizzle of olive oil and more Parmesan cheese if desired. Check out their website http://www.explore-asian.com/bean-pasta/ and head over to your closest Whole Foods Market and pick some up to try!